Jessica Sinclair has worked hard to become a top-notch draftswoman. Unfortunately very few women are in that profession so Jessie is constantly having to prove herself. When she has an opportunity to prove herself at a new job Jessie knows that there will be hurdles to jump in order to gain the respect of her fellow draftsmen. Flynt Kavanaugh is the man that has gotten Jessie her job. He's seen her work and knows that she is the perfect match for their team. Since having a woman on the team is such a novelty Flynt's boss comes up with a plan to keep everyone working and Jessie from becoming a distraction. If Jessie and Flynt pretend they are courting then everything will run smoothly in the office and Jessie will be able to keep her job. Jessie and Flynt both have secrets they prefer nobody ever knows about. Those secrets might prove the undoing of their ruse and their growing attraction towards each other. 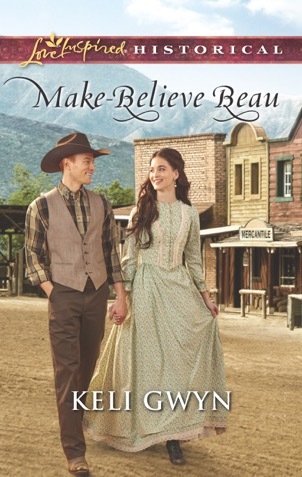 I really enjoyed Make-Believe Beau. Jessie is a strong female character who is independent yet doesn't feel diminished by the comfort or protection of Flynt. Flynt knows how to frustrate a girl! Actually both Flynt and Jessie manage to frustrate each other. Their story is the perfect example of what happens when a person assumes they know what another person is thinking or feeling. There were sweet moments between Flynt and Jessie(the kiss...sigh!). I love the spiritual lesson taught in the story. Jessie's desire to help women caught in unfortunate circumstances showed her heart for obedience to the Lord. Make-Believe Beau is a sweet romance that left me smiling and satisfied.